Apple on Wednesday confirmed a decision to leave conspiracy theorist Alex Jones' Infowars app available for download in the iOS App Store following the removal of his podcast content from other digital platforms including iTunes and Podcasts, saying the app has not violated company guidelines. Apple explained the situation in a statement to BuzzFeed News, saying that while Jones' podcasts were in violation of iTunes policy regarding hate speech, the "Infowars Official" app does not infringe on App Store review rules. "We strongly support all points of view being represented on the App Store, as long as the apps are respectful to users with differing opinions, and follow our clear guidelines, ensuring the App Store is a safe marketplace for all," Apple said. "We continue to monitor apps for violations of our guidelines and if we find content that violates our guidelines and is harmful to users we will remove those apps from the store as we have done previously." The statement suggests Apple is keeping close tabs on the Infowars app, which could be pulled from the App Store should its content run afoul of company standards. Apple on Sunday struck five of Jones' six Infowars podcasts from iTunes and Podcasts, a move that seemingly spurred similar actions from Facebook and YouTube. 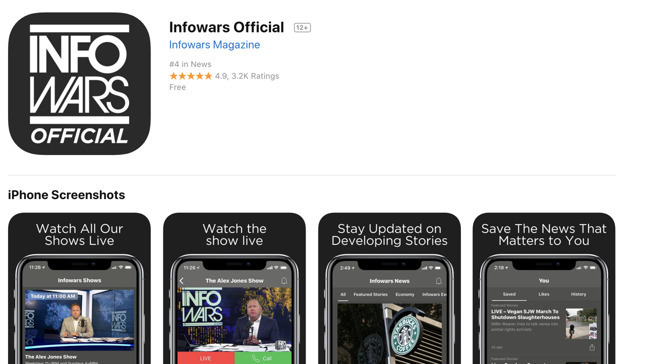 Confusingly, Apple allowed Infowars Official, which offers up streaming access to the same content removed from iTunes, to remain on its mobile app marketplace. the issue over the weekend. As noted by BuzzFeed News, Apple was presented hard evidence of malicious behavior in Infowars' podcasts, as podcast episodes acted as a standing record of malfeasance. The app, on the other hand, serves as a gateway to rotating streaming video content served up by the Infowars website. That leaves Apple a small window with which to catch a bannable offense. Apple's removal of the five Infowars podcasts appears to have sparked renewed interest in the site's iOS app, as its ranking among other "News" category apps jumped from 47th to 3rd in only two days.